We recently reported that the direct antitumor effectors in the liver induced by α-galactosylceramide (α-GalCer) are NK cells that are activated by the IFN-γ produced from NK1.1 Ag+ T cells (NKT cells) specifically stimulated with α-GalCer, whereas NKT cells cause hepatocyte injury through the Fas-Fas ligand pathway. In the present study, we investigated how mouse age affects the α-GalCer-induced effect using young (6-wk-old), middle-aged (30-wk-old), and old (75-wk-old) mice. The serum IFN-γ and IL-4 concentrations as well as alanine aminotransferase levels after the α-GalCer injection increased in an age-dependent manner. An α-GalCer injection also induced an age-dependent increase in the Fas ligand expression on liver NKT cells. Under the stimulus of α-GalCer in vitro, the liver mononuclear cells from old and middle-aged mice showed vigorous proliferation, remarkable antitumor cytotoxicity, and enhanced production of both IFN-γ and IL-4 in comparison to those of young mice, all of which were mediated mainly by NK1.1+ cells. Furthermore, liver mononuclear cells from old mice stimulated with α-GalCer showed a more potent Fas-Fas ligand-mediated cytotoxicity against primary cultured hepatocytes than did those from young mice. Most α-GalCer-injected old mice, but no young mice, died, while anti-IFN-γ Ab pretreatment completely inhibited mouse mortality. However, α-GalCer-induced hepatic injury did not improve at all by anti-IFN-γ Ab treatment, and the Fas-ligand expression of liver NKT cells did not change. Taken together, the synthetic ligand-mediated function of NKT cells is age-dependently up-regulated, and the produced IFN-γ is responsible for α-GalCer-induced antitumor immunity and the mouse mortality, while hepatic injury was unexpectedly found to be independent of IFN-γ. Mouse NK1.1 Ag+ T cells (NKT cells)2 are abundant in the liver (1, 2, 3, 4). These cells include CD4+ or CD4−CD8− cells that are dependent on the MHC class I-like molecule CD1α for their development and use Vβ7 and Vβ8 gene products combined with Vα14/Jα281 gene products for their TCRs (5, 6, 7). They promptly produce IFN-γ as well as IL-4 after stimulation via the CD3/TCR complex, thus indicating that they play a role in either Th1 or Th2 immune response (4, 8, 9, 10, 11, 12). IL-12 activates NKT cells to produce IFN-γ (11) and inhibits liver, lung, and kidney metastasis of tumors (1, 2, 4, 13, 14). In addition, NKT cells activated by endogenous IL-12 may also play an important role in the defense against microbial infections by producing IFN-γ (4, 15). Although the natural ligands of mouse NKT cells are still unknown (4), a glycolipid, α-galactosylceramide (α-GalCer), which was originally found in marine sponges (16), has been shown to be a ligand of NKT cells and specifically activates NKT cells to produce IFN-γ as well as IL-4 (17, 18). The α-GalCer-induced antitumor effect was originally thought to be due to α-GalCer-activated NKT cells (17, 18). However, NKT cells in mice injected with α-GalCer have been shown to rapidly undergo apoptosis and then transiently disappear in mice (19). We also recently demonstrated that NK cells activated by IFN-γ produced by α-GalCer-activated NKT cells are direct antitumor and antimetastatic effectors in the liver (20). In addition, we also recently demonstrated that α-GalCer-activated liver NKT cells are direct effectors for hepatocyte damage via Fas/Fas ligand signaling, using Fas-deficient mice and Fas-ligand-deficient mice (20). In the present study, we show that the ligand-mediated NKT cell functions, including cytokine production, proliferation, and hepatocyte toxicity, are enhanced in an age-dependent manner. Furthermore, the hepatocyte toxicity of such ligand-activated NKT cells is dependent on the Fas/Fas ligand system, but completely independent of IFN-γ, thus suggesting that NKT cells separately use their functional mechanisms against tumors and hepatocytes. C57BL/6 (B6) and BALB/c mice at 6 wk and 30 wk of age were obtained from Japan SLC (Shizuoka, Japan) and considered young and middle-aged, respectively. The old mice were maintained until 75 wk of age at our institution. α-GalCer, or (2S,3S,4R)-1-O-(α-d-galactopyranosyl)-2-(N-hexacosanoyl-amino)-1,2,4-octadecanetriol (KRN7000), was provided by the Pharmaceutical Research Laboratory of Kirin Brewery Company (16, 21, 22). The original solution of α-GalCer (220 μg/ml) was prepared with 0.5% polysorbate 20 (Nikko Chemicals, Tokyo, Japan) in saline and was subsequently diluted with either this solution (vehicle) or saline. The mice were injected i.v. with 100 μg/kg of body mass α-GalCer or with vehicle. In vitro, 100 ng/ml α-GalCer or 10 μg/ml anti-CD3 Ab (145-2C11; BD PharMingen, San Diego, CA) was added to the medium. For the in vivo depletion of IFN-γ or IL-4, mice were injected i.p. with 1.0 mg/body anti-IFN-γ Ab (R4-6A2, rat IgG1; IBL, Gunma, Japan) or 0.5 mg/body anti-IL-4 Ab (11B11, rat IgG1; BD PharMingen) 1 h before i.v. injection of the α-GalCer or vehicle. For the neutralization of Fas ligand in vitro, 10 μg/ml anti-Fas ligand Ab (MFL1, hamster IgG; a gift from Dr. H. Yagita (Juntendo University, Tokyo, Japan)) or its vehicle (isotype Ab) was added to the medium. For the culture of the liver mononuclear cells (MNC), we used an RPMI 1640 medium supplemented with 10% FBS (10% RPMI). For the hepatocyte primary culture, we used a 10% FBS hepatocyte growth medium (10% HCGM) (23) with slight modifications. DMEM (Sigma-Aldrich, St. Louis, MO) containing 20 mM HEPES, 30 μg/ml l-proline, 10 mM nicotinamide, 0.2 mM Asc-2P (Sigma-Aldrich), 0.5 μg/ml insulin (Sigma-Aldrich), 10−7 M dexamethasone (Sigma-Aldrich), 400 nM glucagon (Sigma-Aldrich), 40 mM NaHCO3, and antibiotics (100 IU/ml penicillin G and 100 μg/ml streptomycin) was also used. Hepatic MNC were prepared essentially as described previously (2, 24). In brief, the liver was resected and passed through a stainless steel mesh. The resulting dissociated liver was suspended in 0.05% Collagenase-HBSS, shaken at 37°C for 20 min, and washed. The mixture was next resuspended in an isotonic 33% Percoll solution containing heparin (100 U/ml), and centrifuged at 2000 rpm for 20 min at room temperature. The resulting pellet was resuspended in RBC lysis solution and then was washed twice in medium. After counting the number of cells in the pellet, 5 × 105 cells in 200 μl of the medium per well were cultured with α-GalCer in 96-well flat-bottom plates in 5% CO2 at 37°C. Next, these cells were used for additional experiments. The culture supernatants were stored at the time points of 24, 48, and 72 h after seeding. Hepatocytes were obtained from 6 wk of age mice essentially as described previously (23). Briefly, the portal vein was perfused with 0.05% collagenase (type I; Sigma-Aldrich) and dispersed cells were filtrated through a 40-μm nylon mesh (Cell Strainer; Falcon 2340; BD Biosciences, Mountain View, CA). Based on a morphological examination, ∼98% of the filtrated cells were identified to be hepatocytes. The viability of the hepatocytes estimated by the trypan blue dye exclusion test was ∼95%. In culture, 1 × 105 cells suspended in the HCGM were plated on a 12-well type I collagen-coated plastic dish (Iwaki, Funabashi, Japan). After the hepatocytes adhered to the dish, these cells were used for additional experiments. The surface phenotypes of liver MNC were characterized by a two- or three-color flow cytometric analysis. An FITC-conjugated mAb to mouse TCRαβ (H57-597, IgG) and a PE-conjugated mAb to NK1.1 (PK136, IgG2a) were obtained from BD PharMingen. Before staining with Abs, the MNC were incubated for 10 min at 4°C with Fc-blocker (2.4 G2; BD PharMingen) to prevent any nonspecific binding. For an analysis of the Fas ligand expression, liver MNC were isolated 1 h after the injection of α-GalCer or vehicle into B6 mice. Next, the cells were stained with the FITC-conjugated mAb to TCRαβ, the PE-conjugated mAb to NK1.1, and a biotin-conjugated mAb to Fas ligand (MFL1, IgG; BD PharMingen); immune complexes formed by the latter Ab were detected with Cy5-streptavidin. Flow cytometry was performed with EPICS XL (Coulter, Miami, FL). Liver NK1.1+ MNC were positively sorted using MACS. Briefly, 2 × 107 MNC were stained with the PE-conjugated mAb to NK1.1 for 20 min at 4°C, and then were washed twice in the medium. Next, they were incubated with 20 μl of anti-PE microbeads (Miltenyi Biotec, Bergisch Gladbach, Germany) in 80 μl of 10% RPMI for 15 min at 4°C, and then they were washed once, resuspended in 500 μl of the medium, and transferred onto a separation column for positive sorting that was attached to a Vario MACS separation unit (Miltenyi Biotec). Any adherent NK1.1+ MNC in the column were washed with 500 μl of the medium three times, and then they were filled with 1 ml of the medium and collected using a plunger when the column was removed from the unit. A total of 4 × 105 of NK1.1+ MNC in 200 μl of medium per well were cultured while being stimulated by α-GalCer with plastic adherent cells (Kupffer/dendritic cells). To obtain plastic adherent cells, liver MNC (5 × 105/200 μl) were incubated in 96-well flat-bottom plates in 5% CO2 at 37°C for 2 h, and then any nonadherent cells were gently removed. Next, these cells were used for additional experiments. NK cell-sensitive YAC-1 lymphoma cells were used as target cells. Target cells (3 × 106 cells) were labeled for 1 h at 37°C with 100 μCi of Na251CrO4 in 500 μl of 10% RPMI. Next, they were washed three times with medium alone and subjected to a cytotoxicity assay. Labeled targets (3 × 103 cells/well, total volume of 100 μl) were incubated for 4 h at 37°C in 96-well round-bottom microtiter plates containing 10% RPMI (total volume of 100 μl) and liver MNC (1.5 × 105 cells/well) from each age group of mice, cultivated for 3 days under stimulus with α-GalCer or its vehicle. The plate was then centrifuged, and the resulting supernatants were harvested and their radioactivity was determined using a gamma counter. Cytotoxicity was calculated as the percentage of released radioactivity after correcting for spontaneous release, which was <15% of maximal release. Primary cultured hepatocytes were used as target cells (23). Isolated hepatocytes were plated on a 12-well type I collagen-coated microplate containing 10% HCGM for 12 h. Next, the supernatants including any dead cells from each well were eliminated, and the adherent hepatocytes were labeled with 10 μCi of Na251CrO4 in 1 ml of 10% HCGM for 12 h at 37°C. After 51Cr-labeling incubation, the hepatocytes were washed three times with medium alone, and the cells in 500 μl of HCGM (including 10 μg/ml of anti-Fas ligand or its vehicle in the case of Fig. 5⇓c) were mixed with a 20-fold increased number of fresh liver MNC that were just obtained from each age group of mice and suspended with α-GalCer in 500 μl of 10% RPMI in each well. The plate was then centrifuged, and the resulting supernatants were harvested, and their radioactivity was determined using a gamma counter. To determine the proliferation of the MNC (5 × 105 cells/200 μl) stimulated with α-GalCer or anti-CD3 Ab, the cells were pulsed with 0.5 μCi per well of [3H]thymidine ([3H]TdR) 12 h before the cells were harvested. The radioactivities of the harvested cells at the indicated culture time points were assessed by the liquid scintillation counting method. The mice were i.v. administered α-GalCer. The peripheral blood of individual mice was collected at the indicated time points from the retro-orbital sinus. The IFN-γ and IL-4 levels of the sera or culture supernatants were measured using cytokine-specific ELISA kits (Endogen, Boston, MA). The activity of ALT in the serum was determined with a DRICHEM 3000V instrument (Fuji Medical Systems, Tokyo, Japan). In each experiment, the results were expressed as the mean ± SD. Where appropriate, Student’s t test was used to compare the data of two different groups. Values of p < 0.05 were considered to be significant. 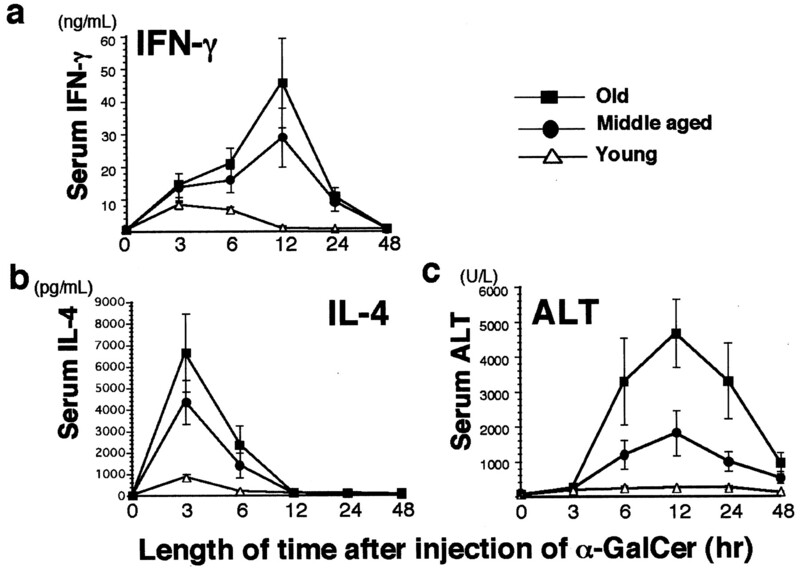 In middle-aged and old mice, the serum IFN-γ levels remarkably increased after α-GalCer injection, reached a maximum level at 12 h after injection, and thereafter returned to the basal level by 48 h after the injection; in contrast, the IFN-γ levels in young mice only slightly increased (Fig. 1⇓a). The serum IL-4 levels also increased age-dependently at 3 h after α-GalCer injection and returned to basal levels by 12 h (Fig. 1⇓b). 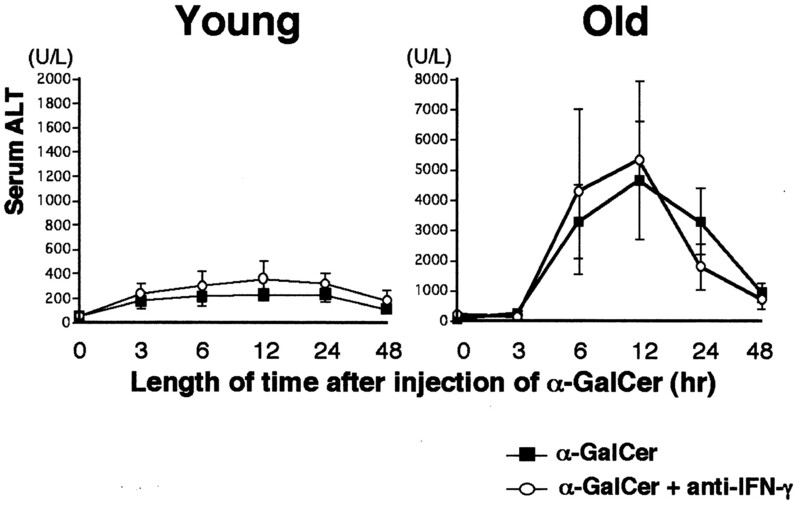 The serum ALT levels as well as the AST levels (data not shown) also increased age-dependently at 6 h after the injection of α-GalCer, reached a maximum level at 12 h, and thereafter gradually decreased, whereas no remarkable change was seen in the young mice (Fig. 1⇓c). 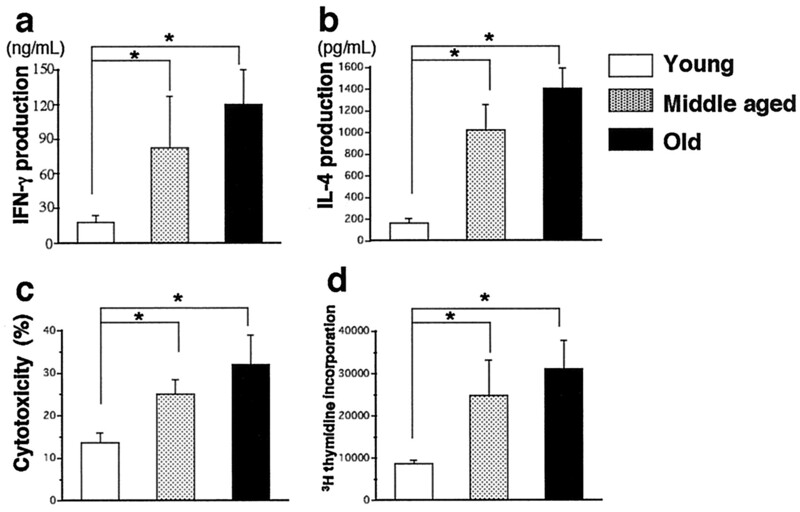 The serum IFN-γ (a), IL-4 (b), and ALT (c) levels after α-GalCer treatment in young, middle-aged, and old mice. Young, middle-aged, and old mice were administered α-GalCer (100 μg/kg) i.v. Peripheral blood specimens from individual mice were collected at the indicated time points (n = 3) from the retro-orbital sinus. We recently reported that Fas-ligand-expressing lymphocytes in the liver after α-GalCer injection are mainly confined in NKT cells (20). 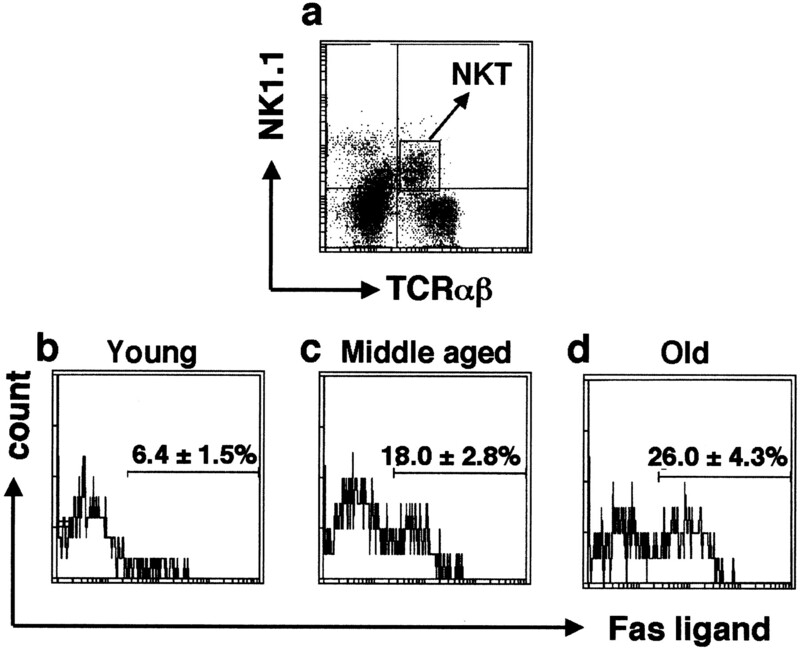 The proportion of Fas-ligand-expressing NKT cells increased age-dependently 1 h after treatment with α-GalCer (Fig. 2⇓). The proportions of Fas-ligand-expressing cells in the NKT cells were 5.7 ± 1.2% (n = 4, mean ± SD) and 1.5 ± 0.6% (n = 4) in the old and young control mice, respectively. The effects of the α-GalCer treatment on the expression of Fas ligand on NKT cells in young, middle-aged, and old mice. a, One hour after the injection of B6 mice with α-GalCer (100 μg/kg) i.v., liver MNC were isolated and subjected to a flow cytometric analysis with the indicated combinations of FITC-conjugated anti-TCRαβ, PE-conjugated anti-NK1.1, and biotin-conjugated anti-Fas ligand (and Cy5-streptavidin). Fluorescence profiles show the effect of α-GalCer treatment as in (a) on the expression of Fas ligand on gated liver MNC (NKT cells) isolated from young (b), middle-aged (c) and old (d) mice. The percentage of the NKT cell subset that expresses Fas ligand is indicated. The results are expressed as the mean ± SD from the liver MNC of five mice in each group. Under the stimulus of α-GalCer in vitro, the liver MNC from the aged mice showed markedly enhanced productions of both IFN-γ and IL-4, a vigorous proliferation, and a remarkable NK activity after 3 days of culture in comparison with those from young mice (Fig. 3⇓). In the liver MNC culture under stimulus with α-GalCer, when liver plastic nonadherent cells from old mice were cultured with plastic adherent cells from either old or young mice, neither the cytokine production nor the proliferation changed (data not shown). This was also the case when liver plastic nonadherent cells from young mice were cultured with plastic adherent cells from either old or young mice. Therefore, plastic nonadherent MNC but not plastic adherent cells (Kupffer cells and dendritic cells) appear to be responsible for these age-dependent functional changes of liver MNC. The proportions of NK cells in the liver nonadherent cells were 15.7 ± 1.6% (n = 5, mean ± SD) and 14.1 ± 3.9% (n = 5) in the young and old mice, respectively. The proportions of NKT cells in the liver nonadherent cells were 19.0 ± 2.6% (n = 5) and 20.4 ± 1.7% (n = 5) in the young and old mice, respectively. These results suggest that functional changes in the liver MNC were not the result of the proportional changes of NKT cells or NK cells. Effect of the α-GalCer treatment on the production of IFN-γ (a) and IL-4 (b) on α-GalCer-induced antitumor cytotoxicity (c) and on the proliferation (d) of liver MNC isolated from young, middle-aged, and old mice. The cytokines released into the culture supernatants were measured 48 h after seeding. The cytotoxicity of the liver MNC was determined in vitro with YAC-1 cells at an E:T ratio of 25:1. The proliferation assay was begun 3 days after seeding. The results are expressed as the mean ± SD from the liver MNC of five mice in each group. ∗, p < 0.01. Purified liver NK1.1+ MNC (NK cells and NKT cells) from old mice stimulated with α-GalCer in the presence of plastic adherent cells (Kupffer/dendritic cells) showed a remarkable proliferation (Fig. 4⇓a) and a markedly enhanced production of both IFN-γ (∼7-fold at 48 h) (Fig. 4⇓b) and IL-4 (∼3-fold) (Fig. 4⇓c) in comparison with those from young mice. However, the anti-CD3 Ab-stimulated IFN-γ production and proliferation did not differ between NK1.1+ MNC from aged mice and those from young mice (Fig. 4⇓, d and e), thus suggesting that the age-dependent functional change of liver NKT cells may be an α-GalCer-specific phenomenon. The effect of the α-GalCer or anti-CD3 Ab treatment on the proliferation of liver NK1.1+ MNC as well as on the production of cytokines from the liver NK1.1+ MNC isolated from young/old mice. Effect of the α-GalCer treatment on proliferation (a) and on the production of IFN-γ (b) and IL-4 (c). The effect of the anti-CD3 Ab treatment on proliferation (d) and on the production of IFN-γ (e). NK1.1+ MNC (NK cells and NKT cells) were positive selected from the liver MNC isolated from young and old mice using a Vario MACS separation unit. The cytokines released into the culture supernatants were measured 48 h after seeding. The proliferation assay was begun 3 days after seeding. The results are expressed as the mean ± SD from five independent experiments. ∗, p < 0.01. Plastic adherent hepatocytes with good viability were obtained after the 12 h primary culture hepatocytes (Fig. 5⇓a). 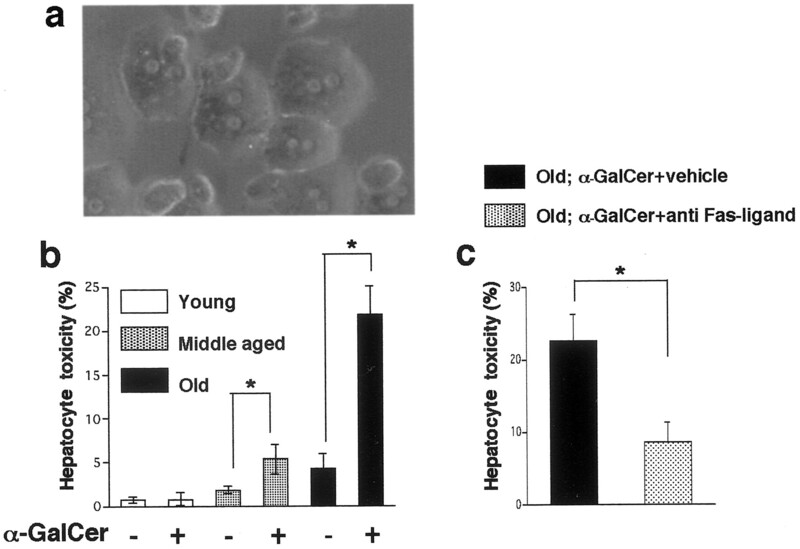 In middle-aged and old mice, liver MNC stimulated with α-GalCer showed a significantly increased cytotoxicity against primary cultured hepatocytes (middle-aged, 2-fold; old, 5-fold) (Fig. 5⇓b). However, the addition of the anti-Fas ligand Ab resulted in a strong suppression of the hepatocyte toxicity of the liver MNC from old mice (Fig. 5⇓c). The cytotoxicity of the liver MNC stimulated with α-GalCer against primary cultured hepatocytes. a, The representative microscopic findings of primary cultured hepatocytes at 24 h after seeding are displayed. b, The effect of the α-GalCer treatment on hepatocyte toxicity in young, middle-aged, and old mice is shown. c, The effect of anti-Fas ligand Ab treatment on the hepatocyte toxicity of the liver MNC in vitro is shown. The liver MNC were isolated from old mice and a hepatocyte toxicity assay was performed under stimulation with α-GalCer in the presence of anti-Fas ligand Ab (10 μg/ml) or its vehicle (isotype control Ab). The results are expressed as the mean ± SD from five independent experiments. ∗, p < 0.01. All (BALB/c; n = 6) or most (B6; 7 of 10) of α-GalCer-treated old mice and some (B6; 2 of 8) of α-GalCer-treated middle-aged mice died within 3 days, whereas all α-GalCer-treated young mice survived (Table I⇓). Anti-IFN-γ Ab treatment completely inhibited the α-GalCer-induced mortality of both middle-aged and old mice, whereas anti-IL-4 Ab had no effect (Table I⇓). However, the serum ALT levels after α-GalCer treatment did not decrease at all after anti-IFN-γ Ab pretreatment in old and young mice (Fig. 6⇓). Furthermore, anti-IFN-γ Ab pretreatment had no significant effect on the expression of Fas ligand on NKT cells in aged mice injected with α-GalCer (data not shown). These findings suggest that the α-GalCer-induced death of mice may be the result of an IFN-γ-induced shock-like phenomenon but is not directly related to the hepatic failure, which occurred in an IFN-γ-independent manner. Effect of the treatment with anti-IFN-γ Ab on the serum ALT levels after α-GalCer treatment in young and old mice. The mice were injected i.p. with 1.0 mg/body of anti-IFN-γ Ab or PBS (−) 1 h before the i.v. injection of the α-GalCer (100 μg/kg weight). Peripheral blood specimens from the individual mice were collected at the indicated time points (n = 3) from the retro-orbital sinus. In the present study, we demonstrated that mouse liver NKT cells stimulated by their ligand, α-GalCer, age-dependently increase in cytokine production, proliferation, and hepatotoxicity. However, anti-CD3-stimulated proliferation and IFN-γ production of the liver MNC did not differ between young mice and old mice. Most old mice died after α-GalCer injection while anti-IFN-γ Ab completely inhibited mouse mortality. Whereas hepatic injury after α-GalCer injection also increased age-dependently, the anti-IFN-γ Ab pretreatment of mice did not improve Fas/Fas-ligand-dependent hepatic injury. We and others previously reported that NKT cells play an essential role in Con A-induced hepatitis (25, 26, 27). IFN-γ as well as IL-4 produced by NKT cells play a critical role in the induction of hepatic injury, and Fas ligand expressed on NKT cells is also, at least partly, responsible for Con A-induced hepatic injury (25, 26, 27). 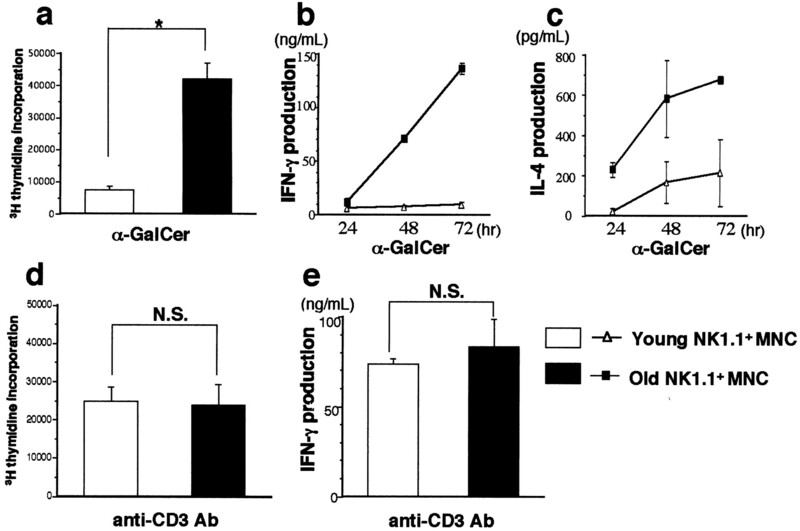 The age-dependent enhancement of α-GalCer-induced activation of NKT cells may be an α-GalCer-specific phenomenon, because the anti-CD3-stimulated activity of NKT cells did not change with mouse aging as shown in the present study, and the severity of Con A-induced hepatic injury was also independent of mouse age (our unpublished observation). Although the systemic response to α-GalCer may be partly attributable to the increased number of liver MNC with aging (3), the proportions of NKT cells and Vβ8+ NKT cells do not differ between young and old mice (3), thus suggesting that the α-GalCer-mediated function of NKT cells is indeed enhanced with aging. In addition, when Propionibacterium acnes-primed mice receive a sublethal dose of LPS, severe hepatic injury is induced (28, 29, 30). This hepatic failure is dependent on IFN-γ produced by NK cells stimulated with endogenous IL-12 and IL-18 (31, 32). Blocking of IFN-γ improved the P. acnes/LPS-induced hepatic injury (31, 32). Furthermore, Gilles et al. (33) reported hepatitis B Ag transgenic mouse hepatocyte to be selectively sensitive to destruction by IFN-γ in vivo. Therefore, it was unexpected, but quite interesting, to note that IFN-γ does not play any role in the hepatic injury induced by α-GalCer. Because an α-GalCer-induced antitumor effect is due to NK cells that are activated by IFN-γ produced by NKT cells and is dependent on IFN-γ yet independent of the Fas/Fas-ligand pathway (20), ligand-activated NKT cells are thus suggested to produce/express IFN-γ and Fas-ligand as different effector tools. It is likely that α-GalCer-activated NKT cells may be programmed to undergo apoptosis after strong activation and thus no longer attack normal tissues. Furthermore, although NKT cells emerged again after apoptosis by α-GalCer injection, these re-emerging NKT cells in the liver are anergic and cannot respond to a rechallenge of α-GalCer (20). It is unknown at present why the ligand-mediated function of NKT cells is enhanced in an age-dependent manner; however, it is possible that NKT cells strengthen their function with age to survey malignant tumors, activated normal cells, and microbial infections. In fact, activated T cells have been reported to accumulate in the liver and undergo apoptosis (34). The hepatic failure induced by α-GalCer itself is not directly related to mouse mortality, and IFN-γ-induced shock may be the cause of mouse mortality because anti-IFN-γ completely inhibited the mortality of old mice but failed to improve the liver injury induced by α-GalCer. We previously reported NKT cells to play an essential role in the generalized Shwartzman reaction in mice induced by an IL-12 injection and a subsequent injection of LPS (11). IFN-γ produced by NKT cells after IL-12 injection is indeed essential for the subsequent LPS-induced mortality in this reaction (11). Therefore, IFN-γ can play a critical role in the shock and death of mice under certain conditions. In contrast, NKT cells have been reported to decrease in mice and humans with autoimmune diseases (35). α-GalCer also reportedly activated NKT cells in nonobese diabetic mice to preferentially produce IL-4 and inhibit the onset of diabetes (36, 37). These findings raise the possibility that NKT cells are a regulator of some autoimmune diseases and α-GalCer can be a useful therapeutic tool for autoimmune diseases. However, NKT cells are responsible for Con A-induced hepatic injury in mice, a model of human autoimmune hepatitis (25, 26, 27). In addition, human CD56+ T cells, which we previously proposed to be a functional counterpart of mouse NKT cells (4, 38), are cytotoxic not only against tumors but also against vascular endothelial cells when they are activated by a bacterial superantigen (39). These findings, together with our present results, indicate that NKT cells are a double-edged sword, and therefore, the therapeutic usage of α-GalCer and its validity in humans still need to be carefully evaluated. We thank Dr. Hideo Yagita (Juntendo University) for his gift of anti-Fas ligand Ab. ↵2 Abbreviations used in this paper: NKT cells, NK1.1 Ag+ T cells; α-GalCer, α-galactosylceramide; MNC, mononuclear cells; ALT, alanine aminotransferase.